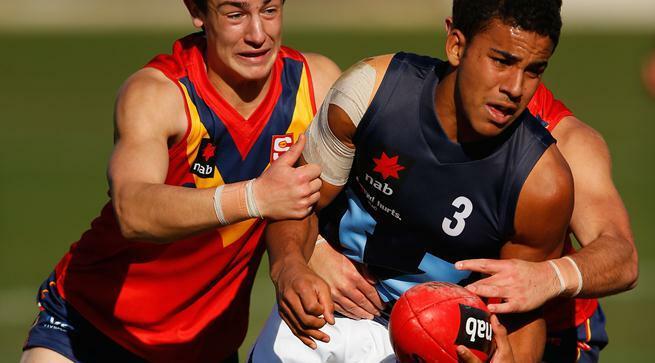 South Australia has won back to back NAB AFL U18 Championship titles, with a nine point win over Vic Metro in the series finale at Simonds Stadium. In a thrilling contest, SA was able to hold off a late challenge by Metro to win 11.13 79 to 10.10 70. Despite not winning the title, Metro did claim the Larke Medalists, with mid Christian Petracca named the best Division 1 player at the Championships having averaged 25 disposals across his five games – with a high of 31 disposals against Vic Country in Round 3. With the title up for grabs, SA started the game in similar style to the way they disposed of Country in Round 5. Their smaller running players were proving the difference in the first term, with Josh Hone (172cm) and Caleb Daniel (167cm) on the board in the first quarter. Vic Metro were made to pay for missed opportunities up forward – Paul Ahern (Calder Cannons) kicking Metro’s only goal of the first term -as the visitors’ quick transition from defence a key to their 16-point quarter time lead. Henry Carey pushed SA out to a 24-point lead early in the second term, but a few positional changes made the difference for Vic Metro, as they started to work themselves back into the game. After a quiet first term, captain Touk Miller (Calder Cannons) started to impact the game, kicking the first of four unanswered goals for Metro. Sam Switkowski (Northern Knights) and Ahern continued to pushed the ball inside 50 for Metro, with Darcy Moore (Oakleigh Chargers), Jayden Laverde (Western Jets) and Brenton Payne (Western Jets) the beneficiaries as Metro tied the scores at 5.6 apiece at half time. The move of Laverde up forward provided the spark Metro needed, with the wingman having eight first half disposals and a goal. Christian Petracca worked his way into the game in the third term, with his strong marking highlighted early. Laverde kicked his second on the run to put Metro in front for the first time in the game. The mosquito fleet again hurt Metro in the third term, as Daniel and Hone goaled to give SA a 12-point lead. Metro pushed late with Laverde the standout with his third goal, and Switkowski hit the post from a set shot at three quarter time to see SA lead by five points at the final change. Despite Metro kicking to what had been the scoring end in the final term, SA did all the attacking early, pushing their lead out to 14 points with 5-0 I50s to start the quarter. Jason Castagna (Northern Knights) kicked one to get Metro back into the contest, but they needed another two to win the game, and four to take the Championship title. When Hone kicked his fourth for SA the task ahead was difficult for Metro, but it was time for a captain’s goal as Miller goaled from a great centre clearance. Jordan De Goey (Oakleigh Chargers) converted from a free kick to get Metro back within a point, and the game was still alive with five minutes left. However SA did enough in the dying stages of the game, locking to ball in their forward half with James Rose kicking the sealer for a nine point win. Laverde was the best for Metro, with his move up forward paying off with three goals, 11 disposals and 3 marks, along with Petracca who did all he could in the second half to try and get Metro the title win with 17 disposals. Dan Nielson in defence, Harry Dear, Sam Switkowski (10d, 6 mks) and Ed Vickers Willis were also among the best for Metro.